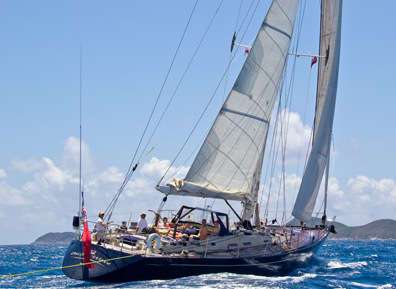 Sailboat charters offer a classic charter experience with wonderful character and charm. Why Choose a Monohull Sailboat Charter? Classic sailing experience: Guests will feel the true power of the wind aboard a monohull sailing yacht. These yachts heel over while sailing, providing an adventurous and exhilarating sailing experience. Owner/Operators: A large majority of our monohull sailboat charters are crewed by the owners of the yacht, which in some cases can provide guests with an added level of attention. Browse our sailboats below. If you have questions or are ready to book your charter, call us in our South Florida office at 954-980-9281, Toll Free at 888-670-6884, or complete our Quick Request Form. Consider one of our sailing catamarans, by far our most popular sailing yacht style. Or consider one of our power catamarans, an emerging trend and our 2nd most popular yacht style. Lynne, Our family had perhaps our best vacation ever. I would be glad to share our experience aboard Sayang with any prospective charterer. You can have them email me if you desire. Thank you. To sort monohull sailboats, click on Size, Max Guests, Low Price or High Price at the top of the table.